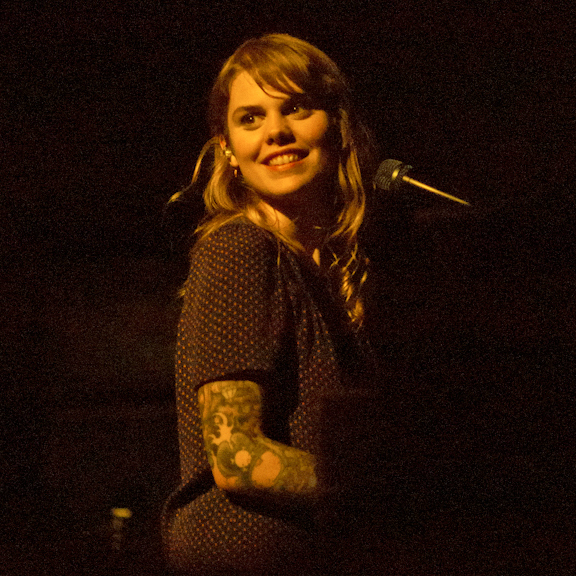 THURSDAY — Beatrice Martin (aka Coeur de Pirate) can charm the pants off of anyone. I was charmed by her beautiful lyrics and voice, as well as her consummate professionalism. Despite suffering from bronchitis that cancelled one of her New York shows last week, the Montreal songstress was able to perform with grace to a crowd of loyal fans who knew her lyrics word for word. She was even able to convince the audience in the back of the room to keep quiet as she finished her set. Anyone who dared to speak over her were shushed by her dedicated fans. Playing solo on the piano, Martin performed songs like "Golden Baby" and her popular "Comme des Enfants". She even sang a cover of the popular '50s song, "You Belong To Me" — she told the story of her father singing it to her as a child and that it's a song she now sings to her newborn daughter. Martin's songs are so captivating and enchanting that they had the audience humming them well after she left the stage.